SWAT Party Bus has a 30 and 45 seater, comes with a driver, full stereo system and laser lights. It's like a nightclub on wheels, with bench seats to interact with your group and a dancing pole for entertainment while you ride. This Mercedes Benz black bus is the best way to get your group from A to B and back again. It is a very roomy and spacious ride and you can bring your own music. 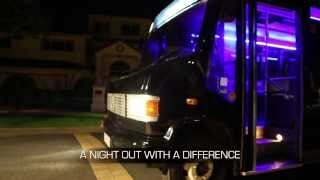 SWAT Party Bus can cater for all groups, drop off and pick ups available. Charter hire is minimum two hours quoted depending on location. From Byron to Brisbane. They can tailor packages to your needs. Awesome for Birthdays, Hens nights, Bucks nights, Airport pickups, or just a night out with a difference. Holds up to 25 people. The SWAT Party Bus and Club Crawl Combo for 10 or more people includes a one and a half hour ride on the coolest party bus Surfers Paradise has to offer. After the ride of your life, your group will be dropped off to join the hangover crawl party revellers and you will receive entry to three of the hottest nightclubs Surfers Paradise has to offer. 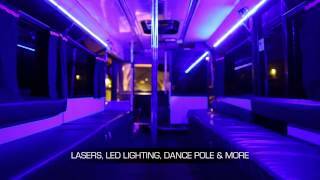 Party Bus holds 30 people, comes with a driver and full stereo system and laser lights. It is like a nightclub on wheels, bench seats to interact with your group, a dancing pole for entertainment while you ride. This Mercedes Benz black bus is the best way to get your group from A to B and back again, very roomy and spacious ride. Can cater for all groups, drop off and pick ups available. Charter hire is minimum two hours quoted depending on location.